July 2017 - Don Mills Builder, Inc. July 2017 - Don Mills Builder, Inc.
As part of the Arbor Run community located in the Oakridge and Stokesdale area, the Apple Grove development offers all brick and stone design homes on half acre or more size cul-de-sac lots, as well as an available pond lot. 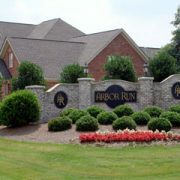 With access to Arbor Run’s private community clubhouse, pool, and tennis courts, you can build the home of your dreams in Apple Grove. 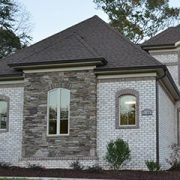 Part of the Arbor Run community located in the Oakridge and Stokesdale area, the Apple Grove development offers all brick and stone design homes on half acre plus size cul-de-sac lots as well as an available pond lot. 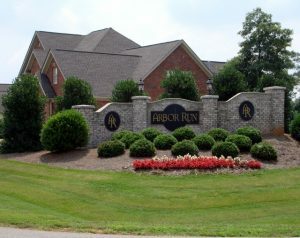 With access to Arbor Run’s private community clubhouse, pool, and tennis courts, you can build the home of your dreams in Apple Grove. Featured in the 2014 Spring Parade of Homes. This home has been SOLD. A new house may literally be better for you. “A new home is less likely to have the health concerns or toxic materials of an older home – things such as asbestos, lead paint, mold, etc.,” says Burtt. And it can be built with certain materials making it better for the environment. “Green appliances/Energy Star rated appliances, and more efficient toilets, plumbing fixtures and electrical fixtures allow you to build “green” for a more sustainable home in the long run. And you have the option to install, sleeve and/or wire for future technology upgrades, such as home automation and solar,” says Burtt. Another advantage to having a home built to your specifications is that the house will have all the features that you want. 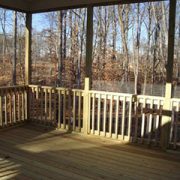 No need to look at all the homes for sale in Greensboro, NC, checking for ones that meet your specifications; with a home built according to your plans and preferences, you’ll be quite happy to immediately move into it when it’s finished. For example, if you want a house with a specific number of bedrooms or want a home with a workshop, you can just discuss it with your trusted builder and have him include it in the construction plan. Building from scratch also means you don’t have to worry about any of the shortcomings of previous owners. Maybe an old owner modified the house to include a lounge that you don’t want, or the windows are too small. Needless to say, renovating a house to meet your tastes can be as expensive as building a new one. Therefore, as long as you have the resources for it, it’s much easier to invest in a brand-new home that reflects your personality rather than trying to change an old one. Building a new home can, admittedly, have a high price tag and take some time. However, considering all the advantages, it can be well worth the expense. 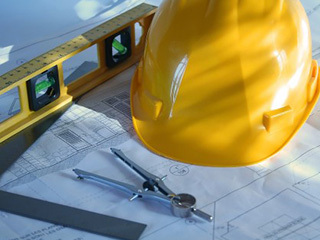 The design process is the most important part of building your new home. No matter how good your blueprints are, no matter how competent your builder, your plan must be well thought out and logically developed to ensure a well constructed home that meets your needs, your lifestyle and your unique personality. The planning and design phase involves using creativity and visualization to realize your likes and dislikes. It involves honest communication with others: your spouse and/or children, your designer and builders, and your banker. Take the time to discuss compromises and different options. Visualize your finished home from the inside out, the feel of each room, corner and hallways. In short, what it will be like to live in. Often there are many regulatory requirements that affect your project, from zoning to allowable setbacks, buildable area, height restrictions, sewage disposal, water and utilities and many more. We are familiar with all regulations to take this stress off of you. Too many people travel far down the road to their dream home only to find out that they can’t afford it, sometimes after construction is already finished. Not only is it important to be perfectly clear about the overall cost of the home you wish to build, but the amount of the monthly mortgage payment (factoring in for times of higher interest rates) and the effect on your overall life cash flow as well. And it is important to include all costs, not just construction costs in your budget. There are additional ‘soft’ costs including design and engineering fees, surveying, driveway and landscaping, septic fields, and building permit fees or development charges. Don Mills will help you decide on a budget that includes all costs with no hidden fees. Don’t forget to consider the physical attributes of the building site: access, wind and sun exposure, and septic field capacity to name a few. Assign areas where specific rooms will be located. Look at access and circulation and begin finalizing a realistic budget. Undertake the difficult but extremely important step of matching your dream with the reality of your financial situation. It is important to build with unforeseen costs and extra spending for special features in mind. It may be necessary to modify your plan at this stage. Double up the function of a couple of rooms, eliminate some rooms entirely, finish the basement at a later date, or tighten up the entire floor plan. The importance of this step cannot be over-emphasized. 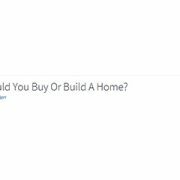 These are the critical decisions that still allow you to have the well designed and beautiful home you want at a price you can afford. At this point you may not have even looked at floor plans nor put pencil to paper. But you are well on the road to having an exceptional home. This phase is best left up to us. It is helpful for all parties involved if you write down some of your thoughts on paper and have a rough idea of what you want. We will help you establish relationships between the various rooms, help choose the primary orientation and the general feel of the home. This is the initial step to creating blueprints and should be reviewed many times by our design experts and yourself, the client. This is the time to make changes and add detail, because once the schematic drawings are finalized, it becomes much more costly to make changes so it is wise to spend extra time getting it right at the beginning. Give Don Mills Builders a call today. With our help throughout the entire process of home building, we can take your vision and transform it into your reality. Finances – A large-scale financial undertaking, such as building a custom home, shouldn’t be pushed through without sound planning and design. Expenses concerning land, building permits, utilities, and professional services need to be settled before starting the project. It is important to include the construction site, as well as the logistics of the design of the house or its architectural style into the overall budget. Building in haste without a solid game plan on design, budget, and schedule will result in a lot of wasted effort and runaway expenses. Location – For this one, a homebuyer’s personal preference should be the primary guiding principle. A homebuyer should decide beforehand the type of community and specific location that would seem best to suit his or her lifestyle; if an individual is an avid surfer, for instance, a seaside location would be perfect. Style – This is where the customer and the builder should work hand-in-hand. 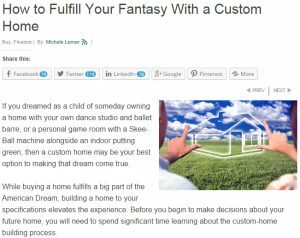 There’s virtually a limitless array of options when building custom homes—some of which may be purely personal in nature, while others may be dictated by the community. 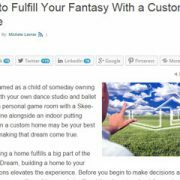 Still, what matters is the customer’s personal input on the kind of home he or she may want to build. Avoid last-minute changes – Planning is absolutely critical. By making even the slightest changes after everything is nearly done, an owner could be looking at significant works, which would add up to the project expenses. 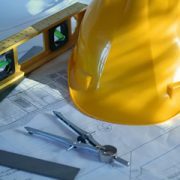 Building custom new homes in North Carolina is a major undertaking, but if a homebuyer should be conscientious enough to take some of these factors in mind, chances are the building project should go quite smoothly every step of the way. 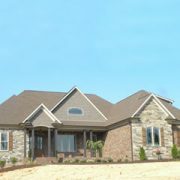 Now is a great time to contract with home builders in Summerfield, NC to build your own home. 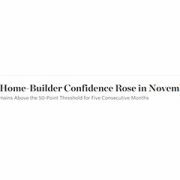 Ideal interest rates and steady job creation contributed to the steadily rising confidence of builders this November, 2014 according to the latest study conducted by the National Association of Home Builders. An index of builder confidence in the market for new single-family homes rose by four points to a seasonally adjusted level of 58 this month, the National Association of Home Builders said Tuesday. A reading over 50 means most builders generally see conditions as positive. The index jumped in September to 59, its highest reading since November 2005, then fell to 54 in October. Economists surveyed by The Wall Street Journal expected the index would tick up to 55 in November. The index has remained above the 50-point mark for five consecutive months, said David Crowe, the home-builder group’s chief economist. “Low interest rates, affordable home prices and solid job creation are contributing to a steady housing recovery,” he said. While the US house market has been struggling to regain sales momentum in the previous years, this uptick on home builders’ confidence signals a resurgence of people’s interest in buying their own homes. Due to these favorable conditions on housing, this could be the perfect opportunity to browse for affordable new homes in North Carolina. While some people prefer condominium units over homes, building your own home definitely has advantages over renting a small space. If you choose to build your home from scratch, you have total control over every aspect of the look and feel of what you want in your home. With a home, you gain privacy, whereas apartments or condominium units are closer to the living spaces of others. Although many homeowners have opted to ‘make do’ with their existing home, low interest rates and an improving economy make this an excellent time to go ahead and build a home perfectly suited for your family.. Custom home builders like Don Mills Builders, Inc. can help turn your dream home into a reality, and with an improved housing market, now is a good time for you to consider building a house. Trends are always changing, and this goes for popular features for new homes as well. 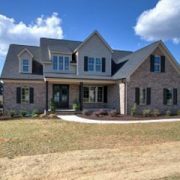 While a high-end kitchen and upgraded bathroom will always help sell houses, there are other features that home builders in Greensboro, NC can include in the home. The second thing that new-home buyers are looking for is an advanced laundry room. Buyers want built-in ironing boards, more storage, upgraded appliances, and other convenient features. Tied with laundry rooms in a survey by NAHB on new home features are low-e windows. Windows treated with Low-E coatings are proven to reduce energy consumption, can help decrease fading of fabrics, such as window treatments, and increase overall comfort in your home. A Great room is also something that is desired in new homes, and the bigger, the better. If the trend continues, it looks like we’re going to see more and more houses with Great rooms. Another trend that would go well with this is the addition of high ceilings. Elevated ceilings are for buyers who want to open up rooms such as the great room, dining room, and living room. Overall, it seems like new-home buyers are looking for houses that are highly-efficient and spacious. If this sounds like you, then inquire with builders with homes for sale in Greensboro, NC and arrange to see houses that would fit your lifestyle better and fit the trends, or discuss building yourself a new home in order to get all the trendy features you want in the house. 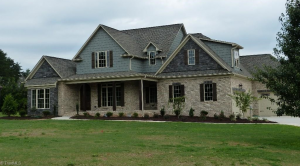 Don Mills is a trusted home builder that has been providing quality custom homes in the Greensboro area for years. Beautiful open plan great for entertaining and living. Mable hardwood on main level. Impressive family room with fireplace and raised ceiling. Open kitchen and screen porch. Amazing kitchen with fabulous cabinetry and marble tops, great appliances. Breakfast room just off kitchen. The primary advantage of buying an already built home is that once the deal is done, you can just move in. Of course, you may want to put a personal stamp on the house by doing renovations or interior decorating, but it can wait for the time when you have more funds. There is also a significant amount of savings when you buy a house that’s already been built; you’ll only pay for the property’s price tag and not worry about construction or material expenses. There are a few downsides to buying though. One disadvantage is that you will inherit the home’s preexisting quirks like drafty windows or creaking floors, not to mention a decor that may not be to your taste. Repairs or even upgrades may be needed to get the house up to what you desire. Older homes may be unique, but they also were built for another time. A house built in the 80s wouldn’t have all the features of a modern one and may also not meet any of the up-to-date building codes. 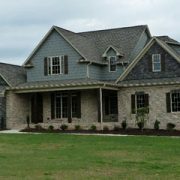 Home builders in Greensboro, NC like Don Mills Builders, Inc. would be the first to promote the main advantage of having a custom home built; it can be customized to meet your needs. Most new homes that are constructed follow either pre-designed floor plans or custom plans; both of these options give homeowners the freedom of picking out what they want for their dwelling. Another advantage of having a home built is that everything is new. From the plumbing to the furniture, you can be sure that everything in your house is up-to-date and won’t suddenly break down on you. Like with any project, building a custom home takes time. Working with an experienced homebuilder like Don Mills Builders, will help make the process of getting the home of your dreams stress-free and rewarding. From initial plans to the final design, building your home that is unique to your style and preferences is worth every step in the journey. Don Mills Builders is an experienced homebuilder with experience and expertise to get the job done right for you.